This is a small community, and among those who are outdoors-oriented, whether in advocacy, government, conservation or just recreation (like me! ), paths often cross. The handful of organizations that lead many hikes around here and work tirelessly for open space protection and preservation and access include LandPaths, the excellent Santa Rosa-based group that tragically lost its field director one year ago. Jonathan Glass’ death at age 36 shocked many, and there have been numerous tributes and memorials to his work and the lasting efforts in and around the North Bay. I met Jonathan a few times on some hikes and meetings and was impressed by his passion, knowledge and respect for nature. 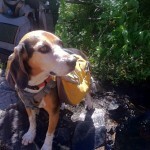 I’m particularly pleased to pass on news of a special and unique hike planned for next weekend in honor of Glass. It’s called the “Market to Mountain Hike” and includes several areas that LandPaths and the greater Santa Rosa community have protected and appreciated. The details are interesting – it’s a 13-mile day-long hike starting near Costco on Santa Rosa Avenue and ending up by the Lawndale entrance to Annadel State Park way over in Kenwood. 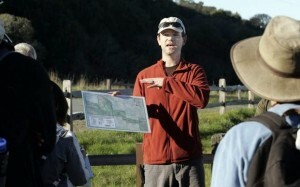 On the way, hikers will go through Taylor Mountain, the county’s newest park, and then head toward Bennett Valley through the Keegan & Coppin open space property and Bennett Mountain and then across Annadel. There will be lunch and restroom breaks and some shuttling, as is necessary on point-to-point hikes. The free hike is on Saturday, April 5, and pre-registration is required. If you’re interested in learning more, click here for the details.